All Web addresses mentioned were functional as of 3-11-16. From the Cumberland Gap to the Atlantic Ocean, this is Virginia Water Radio for the week of March 14, 2016. This week, the sound of water going down the drain sets the stage for examining how lost drips and drops can waste the equivalent of a deluge. Have a listen for about 20 seconds to three mystery sounds, and see if you can guess what aquatic disappearing act is happening in all three. If you guessed leaking water, you’re right! You heard a leaky and continuously re-filling toilet tank, a garden hose with a worn-out connection, and a dripping faucet. Those and other common leaks in U.S. households waste as much as one trillion gallons of water annually, the equivalent of the water used by 11 million households, according to the U.S. Environmental Protection Agency, or EPA. It’s hard to imagine a trillion gallons! So imagine, instead, that your house has a faucet dripping 10 times a minute – that’s over 14,000 drips per day, equal to about one gallon. Multiply that by 365 days per year, and you’ve wasted about four days’ worth of an average U.S. resident’s water use. That kind of drain on water, the energy used to process water, and homeowners’ pocketbooks is the reason for the annual Fix a Leak Week, organized by the EPA’s WaterSense Program and running this year from March 14th to 20th. The effort encourages citizens to fix easily correctable household leaks, like worn toilet flappers, worn faucet washers, and dripping shower heads. Your local government or water utility may be participating this year in Fix a Leak Week—Charlottesville, for example, is having a “Fix a Leak 5K Run” on March 20. But all year long, many utilities offer information to help customers repair leaks and find other ways to conserve water. We close with a little bit of music that’s just right for Fix a Leak Week, courtesy of three water scientists who formerly studied at Virginia Tech. This week’s music was taken from a November 22, 2013, video recording made by J.P. Gannon and Kris Brown, Virginia Tech graduate students at the time, and Paolo Benettin, a Virginia Tech visiting scholar at the time; used with permission. This music was featured in Virginia Water Radio Episode 198, 1-27-14. The lyrics were written by Dr. Gannon and Dr. Benettin. The music is an adaptation of “The Fox (What Does the Fox Say? ),” a 2013 single track and video by the Norwegian duo Ylvis; more information about Ylvis is available online at http://ylvis.com/. Protection Agency (EPA) WaterSense Program, accessed online at http://www3.epa.gov/watersense/our_water/fix_a_leak.html, 3/11/16. Following is the U.S. EPA/WaterSense Web site’s “The Facts on Leaks,” accessed online at https://www3.epa.gov/watersense/pubs/fixleak.html, 3/11/16. ●The average household's leaks can account for more than 10,000 gallons of water wasted every year, or the amount of water needed to wash 270 loads of laundry. ●Household leaks can waste more than 1 trillion gallons annually nationwide. That's equal to the annual household water use of more than 11 million homes. 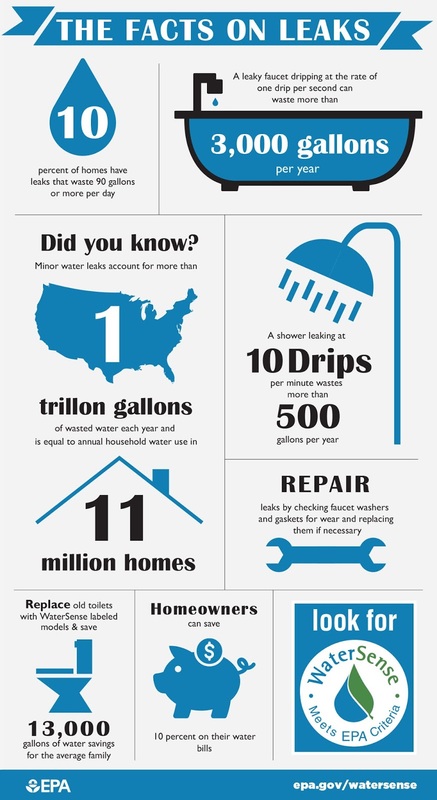 ●Ten percent of homes have leaks that waste 90 gallons or more per day. ●Common types of leaks found in the home include worn toilet flappers, dripping faucets, and other leaking valves. All are easily correctable. ●Fixing easily corrected household water leaks can save homeowners about 10 percent on their water bills. ●Keep your home leak-free by repairing dripping faucets, toilet flappers, and showerheads. In most cases, fixture replacement parts don't require a major investment. ●Most common leaks can be eliminated after retrofitting a household with new WaterSense labeled fixtures and other high-efficiency appliances. Following is the Virginia Department of Health’s “Top Ten Water Wasters at Home and What You Can Do About Them,” accessed online at http://www.vdh.virginia.gov/drinking-water/office-of-drinking-water/water-conservation-tips/, 3/2/17. ●Check your home plumbing for leaks. A leaky faucet or toilet can waste thousands of gallons per year. ●Install water-saving showerheads and faucet aerators, available at your hardware store, if you don’t already have them in place. A shower can use up to 7 gallons of water per minute. Don’t let the shower run too long while waiting for it to warm up or while soaping up. ●Sweep, don’t wash, sidewalks and driveways. Instead of using a hose, use a broom or leaf blower, and save 3-5 gallons of water per minute. ●If you need to water your lawn, do it every other day in the early morning hours. This will minimize evaporation and increase water penetration. ●When you have to replace a water-using appliance, be sure to install a water-efficient model. ●Landscape with plants that require little water and mulch around ornamental plantings to conserve moisture. ●Turn off the tap while brushing your teeth. You probably only need the water in three short bursts – to rinse your toothbrush initially, to rinse it after use, and to rinse your mouth. ●Flush only when needed. Don’t use the toilet as a wastebasket. ●Install a shut-off nozzle at the end of your hose. Use only the water needed for outdoor tasks, such as washing your car. ●Only use dishwashers and washing machines when you have a full load. Water-saving models will allow you to adjust the washer’s water level. Arlington County, Va., Water and Utilities, “Resolve High Bills,” online at http://water.arlingtonva.us/customer-service/resolve-high-bills/. Michael Freeze, “5 Steps on How to Fix a Leaky Faucet, Popular Mechanic, 3/24/15, online at http://www.popularmechanics.com/home/how-to/a3095/5-steps-to-fix-a-leaky-faucet-15470175/. Loudoun Water (Loudoun County, Va.), “Check for Leaks,” online at https://www.loudounwater.org/community/check-leaks. Chris Mooney, The incredibly stupid way that Americans waste 1 trillion gallons of water each year, Washington Post, 3/17/15. U.S. Environmental Protection Agency (EPA), “Fix a Leak Week,” online at http://www3.epa.gov/watersense/our_water/fix_a_leak.html. U.S. EPA “Fix a Leak Week Events Map,” online at https://www.facebook.com/EPAWatersense/app/137541772984354/. U.S. EPA, “WaterSense,” online at http://www3.epa.gov/watersense/. U.S. Geological Survey (USGS), “Water Science School/Drip Caluclator,” online at http://water.usgs.gov/edu/activity-drip.html. USGS, “Water Science School/Rainfall calculator,” online at http://water.usgs.gov/edu/activity-howmuchrain.html. USGS, “Water Science School/Water Questions & Answers: How much water does the average person use at home per day?”online at http://water.usgs.gov/edu/qa-home-percapita.html. Southwest Florida Water Management District, “Water Use Calculator,” online at http://www.swfwmd.state.fl.us/conservation/thepowerof10/. UN-Water, “World Water Day 22 March 2016—Better Water, Better Jobs,” online at http://www.unwater.org/worldwaterday. U.S. EPA, “Calculate Your Water Savings,” online at http://www3.epa.gov/watersense/our_water/start_saving.html#tabs-3 – an online calculator to estimate how much water, energy, and money one could save by installing WaterSense-labeled products in a residence. The following episodes focus on water supply or drinking water. Water supply planning, Episode 261, 4/13/15. Worldwide water needs, Episode 122, 8/6/12. ES.6 – renewable vs. non-renewable resources (including energy resources).